The names of the applications that should be imported are shown here. A valid license key is available in this portal. A valid license key is available in the License Manager but is not assigned to a portal at the moment or there is not a valid key yet. Provides information about the license status. Opens a dialog where the application can be licensed. If you possess administration permissions for the Portal Server and a valid key is available in the License Manager that has not yet been assigned to a portal, you will be asked whether you wish to use this key. If you wish, the key will be automatically assigned to the current portal. If you do not administration permissiones for the portal server, the dialog to enter a new license key will open. 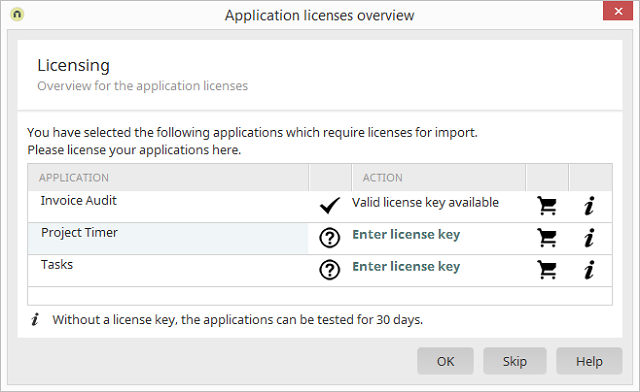 The license key can be copied from the Intrexx Application Store if you have purchased it. Opens the corresponding page in the Application Store. Provides access to the license terms. Opens a dialog with information about the publisher and their terms.